After coaching men’s basketball at Westmont College for 17 years, Chet Kammerer (right) worked with the Lakers and a professional squad in Germany before going to Miami as a scout for the Heat. Here is an excerpt from the Santa Barbara, CA, Independent. See original by clicking here. Chet Kammerer, a man of considerable modesty, was floored when Westmont College wanted him to be the men’s basket­ball coach, and now he is being floored again. On Saturday, December 13, the playing surface at Westmont’s recently renovated Murchison Gym will be dedicated as Kammerer Court. The ceremony will take place at 7 p.m. before the Warriors play Cal State San Bernardino in a non-conference game. Kammerer, the Miami Heat’s vice president of player personnel, coached the Warriors for 17 years, from 1975 to 1992. 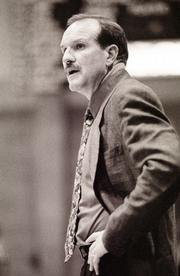 His teams compiled a record of 359-156 and made five trips to the NAIA National Tournament, reaching the Final Four in 1984. He was hardly dreaming of such success when he moved west with a young family after coaching for 10 years at Grace College in Winona Lake, Indiana.